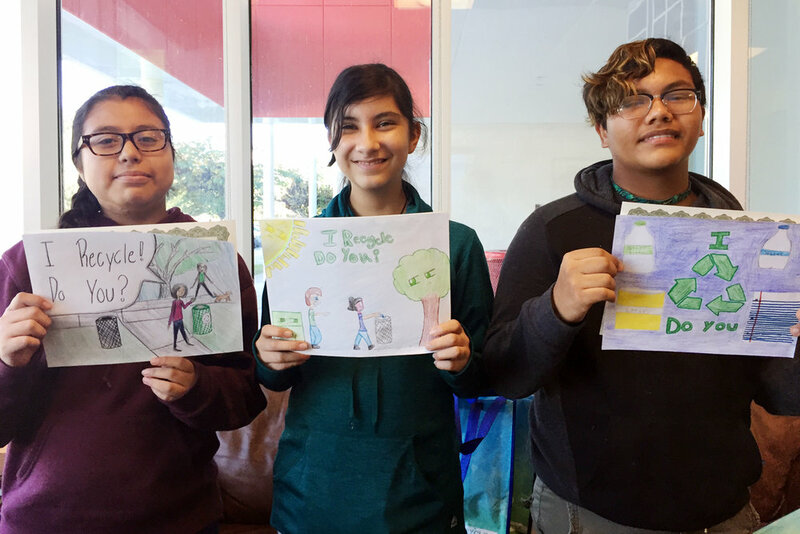 Valley Point Middle School 6th grader, Alicia Martinez, is the overall winner of the 2018 America Recycles Day Billboard Design Contest hosted by the Dalton-Whitfield Solid Waste Authority’s program Target Recycling at School. The winning design will be displayed on two billboards in Whitfield County (one on Cleveland Hwy., and the other on E. Walnut Ave.) during the month of November. Ms. Martinez’s design includes the phrase “I want to be recycled!” one of the themes of the contest. The artwork is an illustration of recyclables lining up to jump into a recycling bin. They are happy and excited to be turned into new, useful objects instead of being wasted. The billboard design contest, now in its ninth year, has a 1st place winner from each grade level including 6th, 7th, and 8th grade. The three winners, listed below, received a certificate of participation and a gift bag with items made from recycled materials. The first place overall, who is the winner of the billboard, was selected from the first-place design from each grade level. The winners all from Valley Point Middle that placed in the America Recycles Day Billboard Design Contest for 2018. From left to right: Alicia Martinez, Rhonda Burdette filling in for Javier Ayabar, and Javiar Torres. Target Recycling at School provides recycling collection services and environmental education opportunities to schools in Whitfield County. For more information, call 706-278-5001 or visit www.DWSWA.org. America Recycles Day is a community-driven event dedicated to promoting recycling awareness, commitment, and action in the U.S. thru its partnership with Keep America Beautiful. It’s celebrated annually on November 15. For more information on recycling, and to take the pledge to #BeRecycled visit www.AmericaRecyclesDay.org. 2017's winner, Lily Woodring's Colorful and detailed billboard. 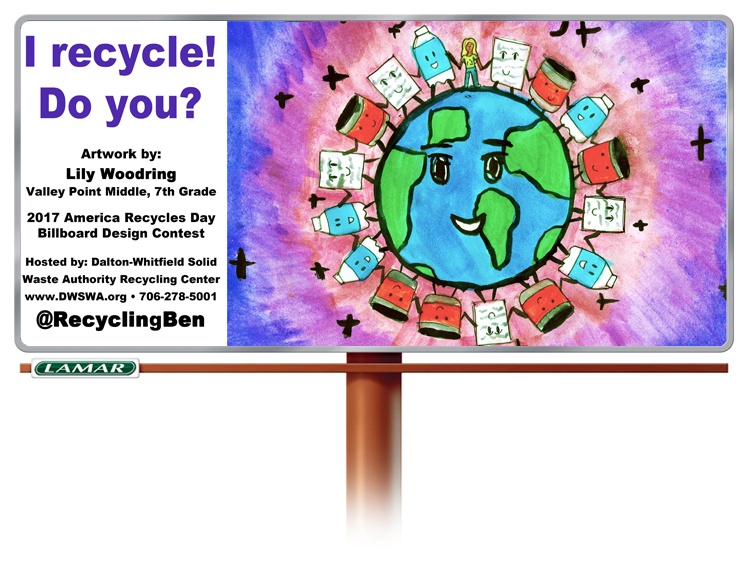 The Dalton-Whitfield Solid Waste Authority is pleased to announce the 9th Annual America Recycles Day Billboard Contest for 6th, 7th, and 8th graders attending public or private schools participating in the Target Recycling at School program in Whitfield County. Students are invited to design a billboard in keeping with the spirit of America Recycles Day, which is celebrated yearly on November 15. The top design out of the three grade levels will be displayed during the month of November on two billboards in Whitfield County. Schools in Whitfield County eligible to participate include Eastbrook Middle, New Hope Middle, North Whitfield Middle, Valley Point Middle, Westside Middle, Dalton Middle, Northstar School, Crossroads Academy, Christian Heritage School, and Learning Tree School. During the 2017 contest, Valley Point Middle School 7th grader, Lily Woodring, won first place overall. Her design includes the phrase, “I recycle! Do you?” which was one of the themes of the contest. The artwork is detailed, neat, and very colorful showing recyclables holding hands around the planet. Themes for this year are, “I want to be recycled!” and “I recycle with Recycling Ben!” First, second, and third place prizes will be given in each of the three grade levels. The grand prize is chosen from the three first-place winners. The Contest Guide with two versions of the official entry form can be downloaded at www.DWSWA.org. The deadline for entries is October 16, 2017. There is no entry fee, however, an official entry form needs to be included with the artwork. Only artwork submitted directly from a school representative will be accepted. Winners will be announced on October 23. For more information contact Amy Hartline, Recycling and Education Program Coordinator, at 706-278-5001 or e-mail: ahartline@dwswa.org. To learn more about America Recycles Day visit www.americarecyclesday.org. 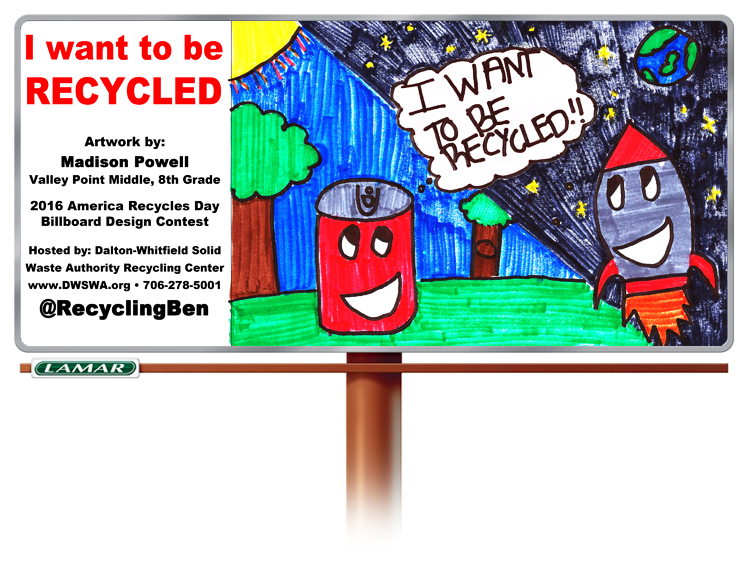 The winning billboard design by Lily Woodring will be placed at two locations in Whitfield County during the month of November in celebration of America Recycles Day. The theme for her design is “I recycle! Do you?”. (Dalton, GA, October 24, 2017) – Valley Point Middle School 7th grader, Lily Woodring, is the overall winner of the 2017 America Recycles Day Billboard Design Contest hosted by the Dalton-Whitfield Solid Waste Authority’s program Target Recycling at School. The winning design will be displayed on two billboards in Whitfield County (one on Glenwood Ave., and the other on E. Walnut Ave.) during the month of November. Ms. Woodring’s design, which was chosen out of 106 entries, includes the phrase “I recycle! Do you?” one of the themes of the contest. The artwork is an illustration of the Earth surrounded by smiling bottles, cans, and paper holding hands with a girl. They’re joining together to make the Earthy happy by recycling which results in the conservation of natural resources. The billboard design contest, now in its eighth year, has a 1st, 2nd, and 3rd place winner from each grade level including 6th, 7th, and 8th grade. The nine winners, listed below, received a certificate of participation and a gift bag with items made from recycled materials. The first place overall, who is the winner of the billboard, was selected from the first-place design from each grade level. Eastbrook Middle School 6th graders placed in the America Recycles Day Billboard Design Contest for 2017. From left to right: Ismael Pimentel, 2nd place; Melanie Figueroa, 3rd place,and Ruby Carrillo, 1st place. 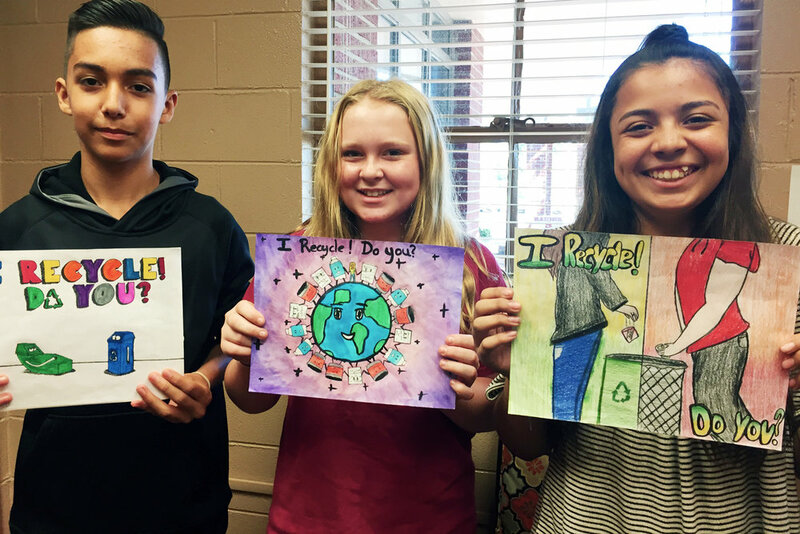 Valley Point Middle School 7th graders placed in the America Recycles Day Billboard Design Contest for 2017. From left to right: Javier Ayabar, 3rd place, Lily Woodring 1st place; Ashlay Zamora, 2nd place. Eastbrook Middle School 8th graders placed in the America Recycles Day Billboard Design Contest for 2017. From left to right: Rocio Arredondo, 1st place, Yosdel Castañeda, 2nd place, and Isaac Fraire, 3rd place. The 8th Annual America Recycles Day Billboard Design Contest is underway. Pictured is the winning design for 2016 designed by Madison Powell, an 8th grader from Valley Point Middle School. The Dalton-Whitfield Solid Waste Authority is pleased to announce the 8th Annual America Recycles Day Billboard Contest for 6th, 7th, and 8th graders attending public or private schools participating in the Target Recycling at School program in Whitfield County. During the 2016 contest, Valley Point Middle School 8th grader, Madison Powell, won first place overall. Her design, chosen out of 91entries includes the phrase “I want to be recycled” which was one of the themes of the contest. The artwork is eye catching and very colorful showing an aluminum can that is dreaming of being recycled into a rocket ship traveling in outer space. Themes for this year are, “I recycle! Do you?” and “I recycle with Recycling Ben!” First, second, and third place prizes will be given in each of the three grade levels. The grand prize is chosen from the three first place winners. The garbage monster makes a surprise appearance in the trash can held by magician Greg Allen during a special performance of the Magic of Recycling show at Pleasant Grove Elementary School on Friday, November 11. Students look on as a rolled-up newspaper magically transforms back into a tree during the Magic of Recycling show with magician Greg Allen. The program was hosted at Pleasant Grove Elementary and six other local schools during the week of November 7. (Dalton, GA, November 21, 2016) – During the week of November 7 students from seven elementary schools hosted professional magician Greg Allen for a special performance of the “Magic of Recycling”. The educational magic show brings the concept of recycling and landfills to life during an interactive 40-minute program that includes magic tricks and audience participation. The program was sponsored by Keep Dalton-Whitfield Beautiful’s recycling committee and the Dalton-Whitfield Solid Waste Authority’s recycling center in honor of America Recycles Day which is celebrated on November 15. During the month of November you can take the pledge to recycle and learn more about recycling online at www.americarecyclesday.org. Antioch, Cedar Ridge, Brookwood, Pleasant Grove, Dawnville, Westwood, and Dug Gap Elementary school hosted either one or two performances for students from Kinder to 5th grade for a total of 12 shows. Local schools currently recycle mixed paper, cardboard, and select beverage containers with the Authority’s recycling collection program Target Recycling at School. Recycling was shown as a way to use things again and again conserving natural resources, and saving landfill space in the process. During the program students saw a glass bottle transform into a new glass bottle, witnessed a telephone book be recycled into a new one, and more. Students enjoyed watching the show while learning about the transformative power of recycling.